An artist's illustration of asteroid Apophis near Earth. The asteroid will fly extremely close to Earth in 2029, and then again in 2036, but poses no threat of hitting the planet either time. NEW YORK — Humanity has made substantial progress in the hunt for near-Earth asteroids that could potentially pose a grave threat to the planet, NASA's chief space rock hunter said Monday (Jan. 14). Don Yeomans, head of NASA's Near-Earth Object Program, told a crowd here at the American Museum of Natural History that it is the smaller asteroids, not giant space rocks, that are difficult to spot. Yeomans' office at NASA's Jet Propulsion Laboratory in Pasadena, Calif., is devoted to finding near-Earth objects (which includes asteroids and comets) and plotting their positions over time. A few of the more notable asteroids NASA has placed on the "cleared" list in the past year include such high profile space rocks as the asteroid Apophis, which will swing extremely close to Earth in 2029 and return in 2036. All told, astronomers have found 90 percent of the large asteroids whose orbits bring them close to our planet. In the near-future, as in this year, there will be other asteroids giving the Earth a close shave, said Yeomans. On Feb. 15, the 164 foot (50 meters) asteroid 2012 DA14 will pass the Earth at a range of about 17,200 miles (27,680 kilometers), well inside the orbit of geosynchronous communications satellites that fly about 22,370 miles (36,000 km) above the planet. 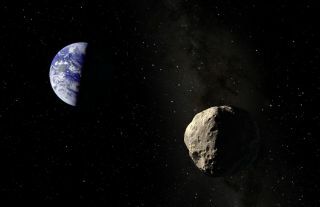 Asteroid 2012 DA14 also poses no threat of impacting Earth during the flyby. Planetary Scientist Don Yeomans tracks near-Earth objects at NASA's Jet Propulsion Laboratory. Yeomans and his colleagues can take close looks at near-Earth objects using advanced radar technology. By sending a beam in the general direction of an asteroid or comet, researchers can measure how long it takes for the beam to leave and then eventually be sent back, to the receiver. Scientists then analyze the reflected signal to determine exactly how far away an asteroid is and gain a sense of the its structure. From there, NASA researchers enlist the help of amateur astronomers for follow-up observations to determine the orbit of a newfound asteroid, paying particular attention to how close the orbit track comes to the Earth. "We observe where these objects are in the sky and project their orbits on years into the future," Yeomans said. If Yeomans and his team did see an asteroid headed for the planet, there are a few courses of action available to them. Landing a small probe on the asteroid to nudge it slightly off course could be one way, while other have suggested impacting the crater with a probe that would drastically change its orbit, he said.